When I made over my son’s bedroom, I knew I wanted to replace the large shelving unit that sat in the middle of his room. It was very industrial and aged and I loved the way that it looked. When I bought it I thought that it would be a beautiful addition to his room and it would give him plenty of space to house all of his favorite things like books, artwork and some games. Well, he did use it for those things…..and laundry, and gaming consoles and piles of other things! Before I started the makeover I put together a Dream Board for his bedroom, which is what I do for all of the spaces I am about to tackle. I have a method that takes the madness out. You can apply it, too, and can read more about how to easily and successfully decorate a room here. The large bookcase created a deep hole in the bedroom and I knew that I needed to make a change when it came to displaying special items. I didn’t want to give him the ability to pile things up on shelves anymore, but I knew that I wanted him to be able to access and look at his favorite things. The decision was made to build shallow picture ledges. They wouldn’t take up very much space and wouldn’t protrude into the room, but act more as an accent to the space and make the space feel lighter. They would also eliminate the potential for any piles and it would allow me to be able to print his favorite photos and place some sentimental mementos on the shelves, again, without overwhelming the space. The shelves were really easy! It required a simple trip to Home Depot for wood. I bought (2) 8′ x 1″ x 3″ boards of select pine wood and (1) 8′ x 1″ x 2″ but you could buy regular pine planks that are really inexpensive, too. When I got home I measured and cut the boards to the size I need. If you don’t have a saw at home, they will cut the boards for you there at the store. I used my nail gun and glue so assemble them. You can see how I the old shelves looked like a deep, dark hole and how I built the picture ledges in the video here or by clicking “play” on the YouTube video on the side of this post. Figure out how long you want your ledges to be. I wanted mine to be about 48″ long and I wanted 2 shelves. (The beauty about making them yourself if you can determine the size.) To save dollars, I bought (2) 8′ -1″ x 3″ pine boards and cut them in half. One piece for the bottom and one for the back. The shelved will end up being slightly under 48″ because of the blade width when cutting….it takes away from the length a little. I also bought (1) 8′ – 1″ x 2″ board cut in half for the front lip. Once dry, I added glue to one long side of one of the 48″ l x 3″ boards and nailed the other 48″ l x 3″ board to it to create an “L”. I then did the same to the other 48″ l x 3″ boards. Be sure to wipe all of the excess glue away from the boards! I like to use baby wipes. Secure the shelves into the wall. I always try to use studs if possible, but if not, I use a simple self-drilling drywall anchor. Always make sure that your anchor can accommodate the weight of the item you are hanging. The lbs. will be displayed on the front of the package and also what type of material you will be drilling in to. If you don’t have the tools that I used, or if they scare you, don’t worry! You can build these with some wood glue and clamps. I found a tutorial for you here. It is really easy! They completely open up a space, don’t you think? I also added a shelf on brackets underneath the picture ledges for his favorite books, etc. I kept it level with the nightstand on the other side of the bed to keep the eye level and to keep it from looking too busy. You should see the complete makeover! I think I made mine for around $20 for two 48″ shelves. 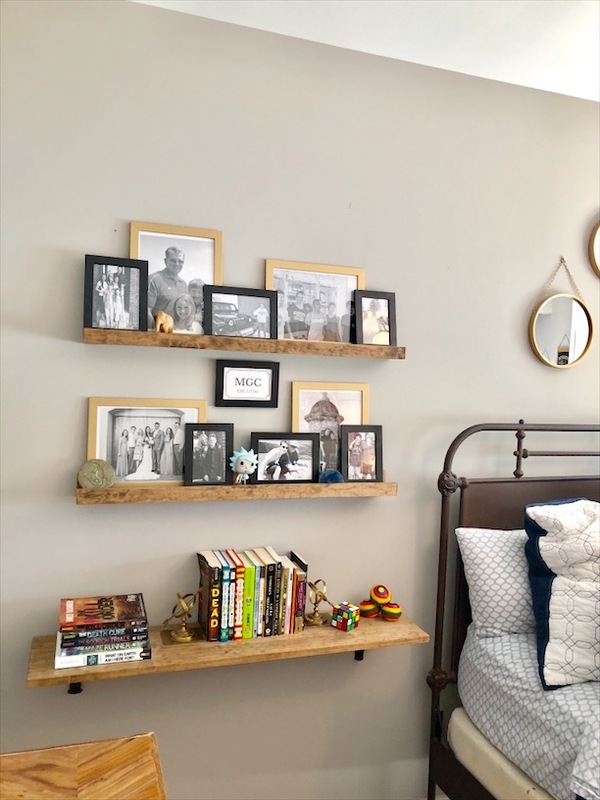 If you don’t want to mess with building them yourself, but want to add a picture ledge (or two) to your space, below are some great options that are 48″ long. There are other sizes available. I really enjoy tackling simple projects that completely change a room. It makes me happy to be able to make such an impactful change to a space without a large price tag attached. What are some of your favorite simple projects? Leave a comment and let me know! Have a blessed week!